As a photographer, you get to capture some of the most joyful and momentous occasions in your clients’ lives. From engagement photos to wedding pictures to maternity and newborn photography to family photos, there’s nothing more incredible than walking with people during these big moments. As you take newborn baby and maternity photos, remember you’re doing more than spending an afternoon behind the camera. You’re commemorating a big step for people by giving them tangible things to enjoy for a lifetime. Whether they put the baby and maternity photos on canvas and decorate their homes with them or find other ways to integrate those photos into their routine, there’s no denying the staying power of beautiful photography. Maternity photography is a method of capturing one of the most joyful periods in a person’s life. Pregnancy photos are a way to commemorate a special time with meaningful images showing a new phase of life. Maternity portraits, including couples photos, make wonderful time capsules and are fun to show children when they’re older. •	Outdoor photos, especially during Golden Hour, often yield beautiful shots that stand the test of time. Even simply taking a walk down the street can provide the perfect backdrop for capturing sweet maternity moments. •	Because the focus of maternity photography is the mother’s bump (and the sweet little one inside it), many mothers want photos that show it off. Keeping the bump visible in maternity photos will make our clients happy. This may mean having a tighter crop when editing or trying new angles to make sure the bump is visible in all its glory. •	If you are looking for couples maternity picture ideas, the baby’s nursery is another simple-but-perfect location to take maternity photos. If parents are nervous about being in front of the camera, it may put them at ease to be in a cozy environment where they are at home. •	Use props, such as nursery decorations or wooden letters for the baby’s name, to add even more of a personal touch. •	If this isn’t the first child for a mother, you may want to consider asking if other children may want to be part of the photo session. While opinions on this may vary, it could make the mother’s day to have all of her little ones in the photos. •	Ask the mother what her vision is for the photo session. Though photographers have lots of experience with capturing a great shot, it’s essential to remember that you are serving a client who may have different expectations and opinions--let them share those with you to ensure everyone is happy with the end product. Newborn photos are a sweet way to capture a baby’s first experience in the world. Often taken a few days or weeks after birth, newborn photos provide the opportunity to photograph totally uninhibited small children with the most adorable results. •	Be sure to clarify with your clients if you’ll be taking pictures of the baby or of the parents with the baby. People have different preferences but knowing ahead of time can help you plan accordingly. •	As with maternity photography, the nursery is often a great spot to do newborn photography shoots. It doesn’t require that the new parents travel with their little one and it allows the baby to be in the comfort of his or her new home. •	Ask the new parents about the baby’s schedule. Getting a good shot will be much more difficult if you are working with a hungry or tired newborn. •	Though it’s tempting, don’t be too ambitious with posing these newborn photos. Often the most magical shots are the ones you get when you let the baby act naturally, whether that means stretching out or being held by a parent. 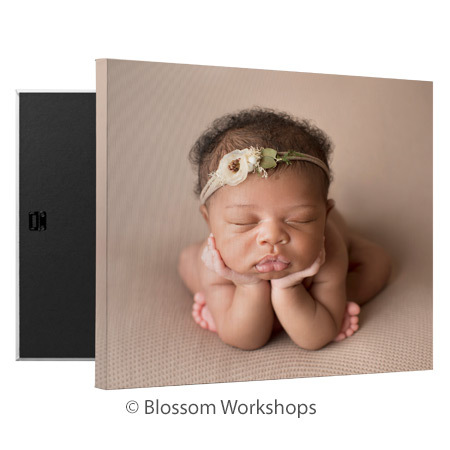 •	One of the ways newborn photography varies from baby photography is that while props look great in a picture, they won’t always help you get the newborn’s attention the way they may with an older baby. Colorful props or meaningful items can be an asset to your newborn photography shoot, as long as they aren’t distracting from the star of the show— the newborn! •	The newborn baby techniques you use with one newborn may vary with another. It’s okay to adapt to the needs of each child, as well as the desires of the parents. Baby photography is one of those things we simply can’t get enough of. With their darling smiles, playful personalities, and general adorableness, babies are such a fun subject to photograph. •	Much like newborn photography and truly any photography involving people or animals, the key to a great shot is having a happy baby to work with. Be sure to work around the baby’s schedule, and not your own, for the most success. •	Keep in mind that babies like to grab things, including your camera. Find a way to use this to your advantage. Use props near the camera to get their attention and bring a smile to their faces! •	Get down on their level. If a baby is crawling or on the go, get down to their height. It’ll make them feel more comfortable while helping you catch them in their most joyful state. When photographing babies, it’s important to remember that they like to move around. Don’t expect them to sit in still or unnatural poses for more than a second or two.